10, rue du Marché St.-Honoré, in the 1st Arrondissement. 01 42 61 03 34. Mon–Fri, 7 a.m.–10 p.m.; Sat, 9:30 a.m.–3 p.m. I don’t know about you, but I find it reassuring that a place like Le Rubis still exists in Paris, particularly in a high-rent part of town, where one of the hottest places to “eat” is something called a water bar. Le Rubis is a 1930s-era bar à vin that seems to have changed little since then. From the zinc bar to the barrels on the sidewalk out front, it’s a kind of time capsule that would almost feel fake if it weren’t so utterly authentic. 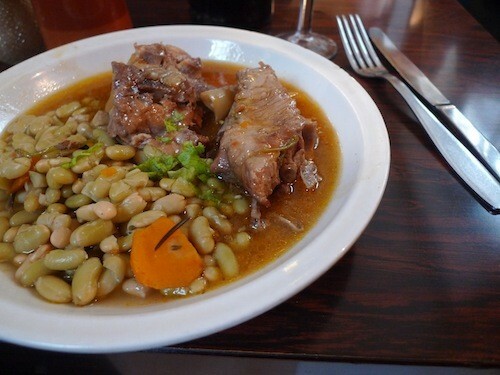 Sautéed lamb with white beans. You can belly up to that bar for a drink and a plate of charcuterie, or take your glass outside like many do, particularly after work. For a sit-down lunch, either take a table in the main room or climb the narrow winding staircase to the first floor, to the cheerful salle with wine-label wallpaper and an ardoise telling you what there is to eat. 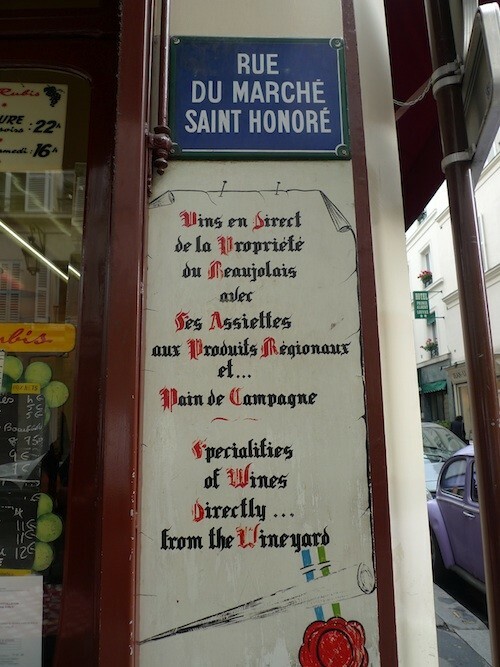 The wines are on the wall, too, listed only by appellation and price, with no mention of vintage or vigneron. Beaujolais (think Morgon and Fleurie, not nouveau) is particularly well represented. We went with a Côtes du Rhône, gently priced and surprisingly good at 15 euros. The food is as unpretentious as the wine. Saucisse with lentils, hot saucisson, sauté of lamb with white beans, tripe and tête de veau: this is the kind of fare you’ll see on the menu here. You can start with charcuterie, an oeuf mayonnaise or a salad, but you won’t need it. The mains are filling and rich, a kind of high-cholesterol home cooking that will put you in a good mood, particularly when you realize that it all costs so little. Dessert (a soggy-crusted pear tart and an overbaked clafouti) was disappointing, but I should have known that cheese would be a better choice, not to mention an excuse to order more wine. Le Rubis isn’t for everyone. Picky eaters and snobs should go elsewhere. It’s not for the shy, either. A visit here is an experience, and engaging with the locals is part of it. Don’t be surprised if a neighboring party offers you a splash of wine, and if it doesn’t happen to you, consider making the offer yourself. 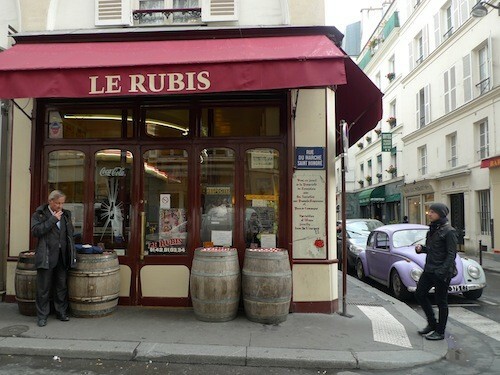 In a nutshell: Le Rubis is where to fulfill your fantasy of old Paris while refilling your wine glass. Price check: Main courses are no more than 12 euros. The only way to overspend here is by drinking too much. If you like Le Rubis, you’ll also like Le Baron Rouge. Read a full review here. 1, rue Théophile Roussel, in the 12th. 01 43 43 14 32. Tues–Thurs, 10 a.m.–2 p.m. and 5–10 p.m.
Fri–Sat, 10–10; Sun, 10 a.m.–4 p.m.